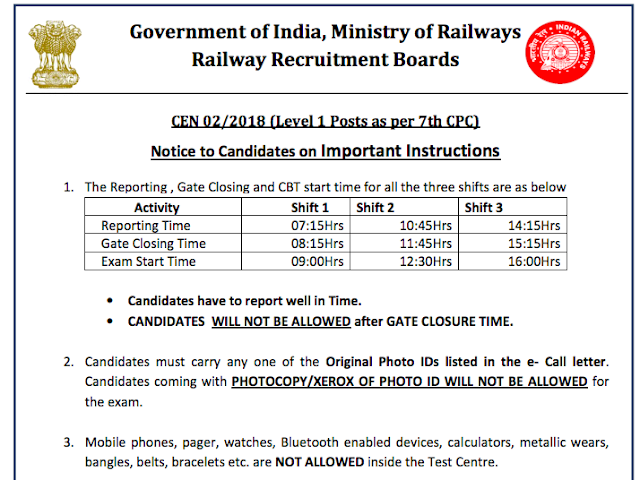 Hello dear, we are here with very important instruction from RRB Railway Notice regarding Exam time and shifts for Group D 2018 Exam. Candidates have to report well in Time. CANDIDATES WILL NOT BE ALLOWED after GATE CLOSURE TIME. Candidates must carry any one of the Original Photo IDs listed in the e- Call letter. Candidates coming with PHOTOCOPY/XEROX OF PHOTO ID WILL NOT BE ALLOWED for the exam. The e-call letter is not having Self Declaration paragraph. The paragraph will be displayed on the computer screen before start of the exam and candidate should write the same in the space provided in the e-call letter in the exam lab only. Indulging in any type of malpractice /unfair means / misbehaviour / indiscipline /impersonation at the examination venue will lead to disqualification in the exam and debarment from all future RRB Examinations & Appointment in Railways.